The Bengaluru (formerly Bangalore) landscape faces a solid-waste threat with nearly 5,000 tonnes generated on a daily basis. As the city sinks in its own waste, the citizens have tried every method of protest possible that will wake up the city’s civic administration. The Greater Bangalore City Corporation, which is tasked with keeping Bangalore clean, is yet to find any scientific solution to dispose of waste in an environment-friendly manner. Bangalore’s burgeoning garbage stems directly from its thriving high-tech economy. The city’s population of 10 million has grown by 50 percent since 2001, and at least 3 million more Indians are expected to migrate to Bangalore in the next decade. While waste management continues to be a perennial problem, an initiative named Daily Dump is pioneering a sustainable solution for Bengaluru. 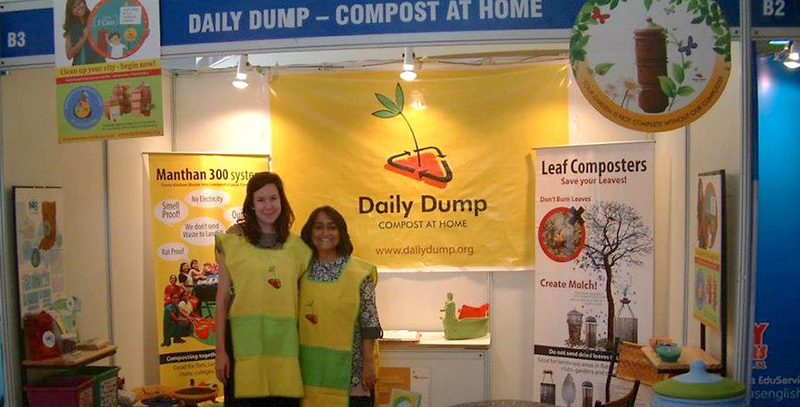 In September 2014 alone, Daily Dump, a brand owned by PBK Waste Solutions Pvt Ltd, helped keep out 14,859 kgs of organic waste from landfill through its innovative solutions. The Daily Dump model is simple: “As a service, Daily Dump helps you manage your household waste and convert it to useful high-quality compost. It supports you with flexible service plans to achieve your goal of becoming a green citizen. We’re involved in developing a range of composting solutions, and already have a number of simple home composters. The Daily Dump products are designed to ensure that you compost at home, conveniently and hygienically.” The solutions result in 80% reduction of daily waste and saves 5.84 kg of carbon emission per household in an year. Poonam Bir Kasturi launched the Daily Dump brand in 2006. Poonam, a National Institute of Design graduate, co-founder of Industree and founding faculty of Srishti School of Art, thought of how design could make a difference in our daily lives. An industrial designer by profession, her premise behind Daily Dump was to: “convert your kitchen waste into compost at home using a composter.” Working on an open source platform, while encouraging others to clone the concept, Daily Dump offers terracotta composters and various other products for both the home and the larger community. Daily Dump composters, or khambas (a three- tier small composter costs Rs.990, and the large one Rs.1,600) operating process starts by segregating the garbage. The units are usually two or three tiered and require an equal mix of wet garbage and dry leaves/ shredded newspaper. This needs to be stirred as garbage comes in and the units are filled in turn as the waste in old ones turn into compost. Educating the public has been a constant endeavor at Daily Dump. Daily Dump conducts a daylong tour called Trash Trail for citizens — which includes interactions with small-scale entrepreneurs, recyclers, sorters and dealers. A website, Recycle Guru, helps communities recycle their dry waste and support the informal waste dealers in the process. For making a positive civic difference, Daily Dump was conferred the Namma Bengaluru Social Entrepreneurship award in 2014. Poonam Bir Kasturi’s mission does not stop with selling home composters; she hopes to sensitize people about those working with household waste everyday. Changing the public mindset on garbage dumping requires consistent inputs and Daily Dump has helped spread the message that household management of organic waste is the most relevant and reasonable method to deal with an otherwise threatening scenario in Community Health.